Every Sunday morning I work at the barn where I board my horse Riley. Last Sunday I awoke to a snowy, blustery day. Bundling up in my bad weather duds, I headed out to Northampton to do the standard morning chores at a 24 horse barn. After haying, feeding and watering, I started leading the first two horses to their pasture. About half-way down to their field, suddenly both horses went rigid and stopped in their tracks. Their gaze was fixed on something I couldn't see. What was out there??? Then I saw movement and a faint outline. A cluster of white helium balloons, barely visible against the snowy backdrop, was tangled in a branch about 50 yards away. They bobbed in the wind, and horses are greatly alarmed by this sort of thing. No time to marvel at their acuity -- the boys were about to bolt. Shaking their lead ropes, I took big strides forward and told them "you're fine" as we passed the scary foreign objects. We made our way to the pasture, the horses dancing and snorting. No one had stepped on my toes, but my arms ached from holding them in check. On the way back I walked into the pasture and grabbed the balloons. It was snowing lightly. Trudging across the barren white field in my Carhartt coveralls, carrying a cluster of balloons in my mittened hand, I wondered what an observer would make of this scene. What an enigmatic photo this would make! How would you caption it? Anyway, that's what the poem is about. Glad to hear you held onto the horses, balloons are very scary objects to deal with. 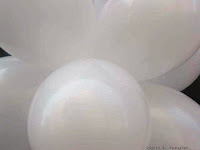 White balloons and white snow, they certainly have good eyesight!